You will be impressed with this newly remodeled Sun Meadows home. Beautifully decorated with luxury amenities such as oversized tile counter tops, custom cabinets with island bar seating, top of the line bedding, flat-screen TV, stone tile floors, French door refrigerator and comfortable living style. Everything in this condo has been replaced to maximize the true serene environment of the Kirkwood valley. Attention to detail shows at every decision from furnishings, window coverings, kitchen appliances and bed configurations. This is a 3 bedroom condo each having its own bath with two masters, one on the main floor and one upstairs. In addition, there is a TV/game upstairs, perfect for the kids to do their own thing while the adults enjoy the downstairs views and fireplace. This would be best for two small families or one large one. 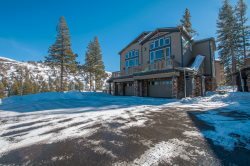 This Sun Meadows condo is almost ski-in ski-out because it is right across the street to the Lodge so you can walk right out of your condo building and be right in the center of everything. You can be skiing in less than 3 minutes when you stay here. It's easy to come home at lunch or after a long day of skiing. What is nice about not being right on the mountain, is it's a little quieter and more private in case you have family that doesn't ski but wants to join you for the trip to Kirkwood. Sun Meadows is situated at the heart of the action, set between the Village Plaza chair lifts and Kirkwood Meadow. Four separate buildings comprise the Sun Meadows complex, each housing a variety of individually owned residences. Sun Meadows Two is right next door to Expedition:Kirkwood and Cornice Grill and provides spectacular views of Red Cliffs and the meadow; The Cornice Grill, featuring pub food and a full bar (seasonal), is located within your complex, giving you yet another option for an easy meal out or an après ski cocktail. A resort shuttle stops in front of the complex, making the trip to the Timber Creek base a breeze. "As someone who doesn't ski in the family, I enjoyed this condo because it was the perfect place to walk right out the door and snow shoe and while in the home enjoy the amazing views by the fire." This property is for sale for $560,000 - please inquire on information on your next mountain home!